This was taken out on a dock on a mystery lake on the East Coast. (Take a guess?) Photoshop steps were just USM to sharpen it up a bit (the fog was thick) and about 30min of dodge and burn for a grungy effect. I had to photoshop this twice because the first one got corrupt during a file transfer. Took a long time and I'm really looking forward to this doing well. Thanks for the votes in advance! I was lead to this through the Favorite Image of the Person above you thread and I must say, it is amazing. I really really love this photograph. Very nicely done. I wish there was more appreciation for shots of this type. 108th place? Just looking around your photos. I wasn't really focusing on the tilt of the horizon because there's better things to notice! Anyway, love the simpleness of the photo and the exposure, focus and color are all amazing. Message edited by author 2009-11-08 22:07:02. Hi Coleman, my first impressions of your image were of serenity, a pause in the day as your title suggests. I was unfortunately equally grabbed by the tilted horizon! I was interested to see that you didn't use any fancy software to acheive your grungy look, so kudos to you for that :) The look works well for this image, it's a bad weather stops play kind of a day, and you've enhanced that feeling nicely with your editing. Now then, why didn't you spot that tilted horizon??! Do you sit crooked in your chair? I do and sometimes I get my horizons wrong because of it, so I use the grid in photoshop to check for straightness. I wonder if your score would have been different if the horizon was straight. Watch out as well for halos coming in with the USM (especially visible on the left jetty post) I understand you were trying to combat the fogginess so a high radius but low, low amount would be a good technique to try. Overall a good image given some real moodiness by your editing, just a few technical details to address. Coming or going? I'm not sure which is the case but in either case the rain has siezed the day. Simple but powerful. I would have fixed the tilt. I like the look of the boat. 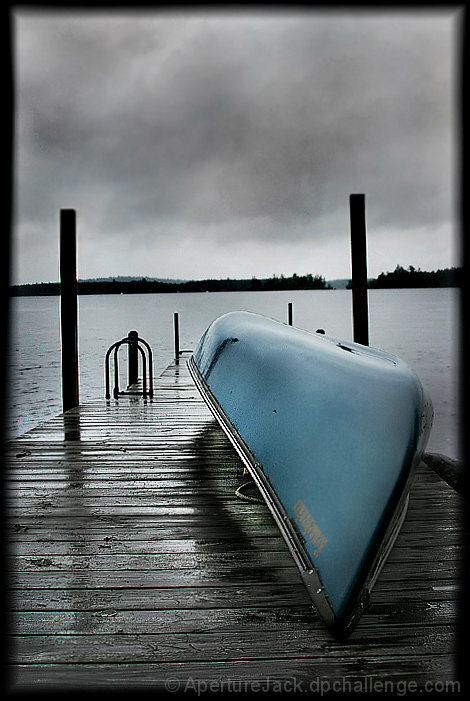 I love the dark reflection of the edge of the canoe in the dock. A perfect example of how the ordinary can be made extraordinary. Proudly hosted by Sargasso Networks. Current Server Time: 04/23/2019 09:53:06 AM EDT.